The term “rat king” can mean many different things. If you’re a city-dweller, student of history, or Dennis Duffy, it means the urban legend of a colossal rat swarm all conjoined at the tail. If you’re an 80s kid, it means an erstwhile Pied Piper who frequently clashed with the Ninja Turtles defending his own corner of the sewer. And if you frequent Paddy’s Pub, it’s the honorific bestowed on Charlie Kelly, who with his ratstick has eradicated generations of those little fellows in his crusade to make sure the bar’s most parasitic residents are its owners. However, a version of this story that no one’s ever seen before is a 20-foot tall giant man-rat composed of other rat-men, so Grimm definitely scores points for originality on that one. “The Rat King” is one of those episodes of Grimm that decides to forego its byzantine plotting and elaborate wesen social structuring in favor of doing something truly crazy, and the explanation this week—that Reinigen can bond together in a process involving cancer-like cells—is out there even for this show. Unfortunately, it does so in an episode that’s also trying to do the aforementioned plotting and social structuring, and the marriage between the two prevents either part from connecting. That’s a shame, because “The Rat King” does a good job setting up its titular antagonist. Drawing on Grimm’s deep bench of wesen and their various interspecies conflicts, it takes the alley cat Klaustreichs and scavenging Reinigen and extrapolates from that to create a “Reine bashing” tradition, one that’s flipped on its head when something massive appears to turn the tables. Unlike the Maagd Zoektocht last week the initial conflict here is coming up organically, the feeling that the status quo is no longer enough for some people and it’s time for them to take matters into their own hands (or paws, as it may be). And of course, it helps that when the rat king does make his appearance, he looks terrific. Much like Gorilla Grodd on The Flash, the rat king is an impressive bit of CGI for the constraints of a network drama, making good use of various shadows and blocking to obscure what could come across as fake in another light. Grimm can occasionally make its monsters look silly when they’re supposed to be terrifying, but the werewolf-like aspects to this design are well-conceived and the production team manages to make it look highly threatening as it towers over Nick and his allies. Unfortunately, the problem with “The Rat King” is that there’s just not enough of the titular rat king to be satisfying. I’m not sure if it came down to budgetary issues of said CGI, but when I’m promised a ratzilla and it looks as cool as this one does, I’d like to see it do more than just lumber around a junkyard, walk into a power line, and then turn back into a pile of vagrants. There’s potential in this idea for a full junkyard skirmish on the level of the zombie attacks of “The Ungrateful Dead,” the team moving from one hiding place to another and having to improvise a solution to gradually weaken it boss fight-style. Instead, the rat king appears and is gone in the span of a commercial break and one scene, dismissed in a manner that mitigates the potential awesomeness and the existing sense of dread. True, a rat king storming through any part of Portland would be tough to explain away to the general population, but this show’s made greater leaps over four and a half years. It’s also likely that episode running time got in the way of the action, which illustrates the issue of Grimm having to balance its case of the week with its ongoing narrative. The cliffhanger reveal of Trubel’s survival at the end of “Maiden Quest” means that the plot has to jump right into dealing with those ramifications, and the first act juggles between Nick desperately trying to keep an eye on Trubel and the Klaustreichs on their drunken hunt. It’s an uneasy balance and one that runs through the entire episode: A moment that personifies this is when in the middle of a research session Nick has to explain to Rosalee and Monroe that Trubel’s still alive, and he only does that because it comes up due to a phone call. For as close as these people are, that feels like information you share right away. Trubel’s largely out of commission this week though as a result of her beating—the source of which is still unknown—so Meisner has to step up. 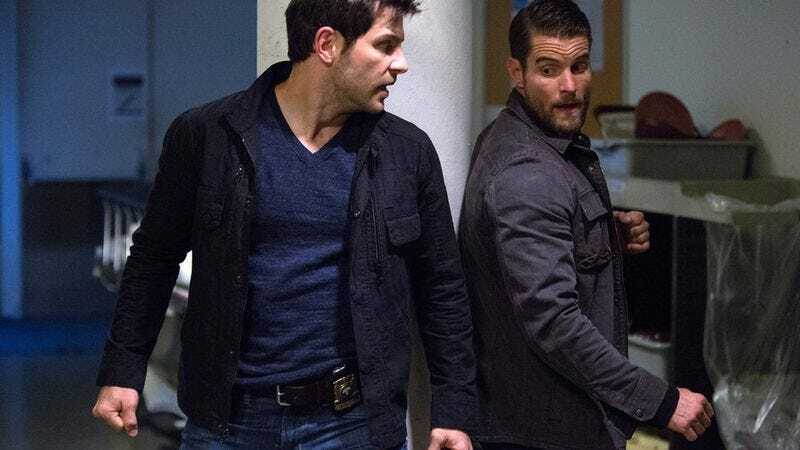 After being relegated to domestic duties in the last couple episodes Grimm finds a smart narrative use of Adalind, her past with Meisner helping to bridge the suspicion between him and Nick. That bridging allows the two to bond over the time-honored tradition of beating the stuffing out of a trio of wesen who try to abduct Trubel, a sequence that neatly deploys hospital corridors and elevators for a feeling of claustrophobia. While an actual conversation is still forthcoming—and the questions about what exactly is going on with the vague yet menacing government agency are starting to pile up—the pieces are finally in each other’s orbit enough to feel as if the answers are going to be satisfying. Satisfying is a word that eludes “The Rat King,” which is a shame given how many things there were to like scattered throughout. There’s not enough rat king mayhem to live up to expectations, and while the Occultatum Libera mystery is getting closer to some sort of resolution that resolution still remains out of reach. It’s a shame the split between the episode’s case and the season’s plot was so pronounced this week, because this felt like an instance where both had enough juice to hold up their own episodes, and cramming them together left both less defined as a result. This Week In Portland: Portland’s latest bridge, the Tillikum Crossing, is clearly visible from the edges of the dump, and from the angle of things the quarry is on the lower southeast side of town. This Week’s Epigram: Surprising no one, tonight’s comes from The Pied Piper Of Hamlin, which also provided the epigram all the way back in season one’s “Danse Macabre” where Reinigen were first introduced. Also this week, Renard’s councilman friend Andrew continues trying to secure his endorsement for the mayoral race, and dangles an enticing carrot by offering to make Renard chief of police. While it’s been talked about before what the experience of wesen looking into a Grimm’s eyes is like, I think this might be the first time we’ve seen it take place. Please correct me in the comments if I’m missing an instance. As Selina, Scream’s Carlson Young didn’t have much to do in this episode, but if reports are true and it’s a recurring role that could change in future weeks. The position of the tree and cornfield where Nick and Hank find the bodies bears a striking resemblance to the initial murder scene from the True Detective pilot.